Hakone Circle Route is a full one day journey starts and ends at Hakone Yumoto station. You can use Hakone Free Pass, Fuji Hakone Pass, or Hakone Kamakura Pass, issued by Odakyu groups to travel this route. Most of the highlights in Hakone are located along this route. Traveling through this route, you can enjoy varieties of rides, such as mountain train, cable car, ropeway, pirate ship and bus. Hakone Yumoto station is the terminal station of Odakyu Romance Car (Express train) from Shinjyuku station. It is an entrance station to Hakone mountains. Hakone Tozan Train (mountain railway) starts from this station. Hakone Tozan Train is the only mountain railway in Japan. The train departs from Hakone-Yumoto station (108m elevation) and takes about 40 minutes to reach to the final stop, Gora station (553m elevation). There are three switchbacks, where the driver and the conductor change shifts and the train travels to the opposite direction. It is a special experience that you can enjoy only with the Hakone Tozan Train. 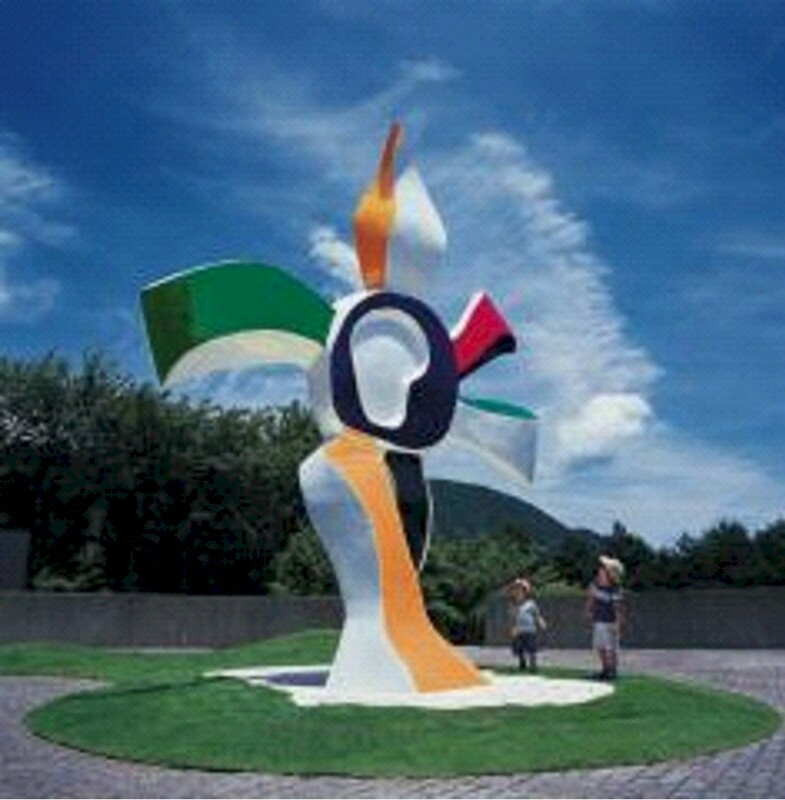 The Hakone Open-Air Museum was founded in 1969, becoming Japan’s first outdoor, open-air museum of art. Some 120 masterpieces by famous modern and contemporary sculptors are permanently displayed in a 70,000m2 garden with a view of the Hakone mountains. Visitors can enjoy various arts along with having a picnic in the garden. If you visit with small children, there are few places that your children can enter inside, climb up, and play with arts. Visiting this museum takes 1~2 hours depending on how much you would like to spend the time with arts. Gora station is the terminal station of Hakone Tozan Train located at 553m above the sea level, where you will change to Hakone Tozan Cable Car. Just above the Gora station, you will find Gora Park, a Western style garden opened in 1914. You can enjoy seasonal flowers, such as Cherry Blossoms, Roses, Azaleas, Hydrangeas, Bougainvilleas, etc. Haku-undo Tea House was built inside of Gora Park in 1914. Although the style of this tea house and garden follows the basic rules of traditional tea ceremony, you can find many well-selected materials and elements here and there which were introduced by the master of this house. Matcha Tea is served in here, so you can have an experience of Japanese tea ceremony. 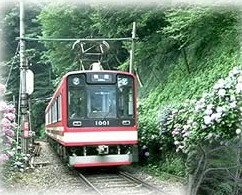 At Gora station you will change the train to Hakone Tozan Cable Car. This cable car links Gora Station to Soun-zan Station, a distance of 1.2 kilometers, in 10 minutes. 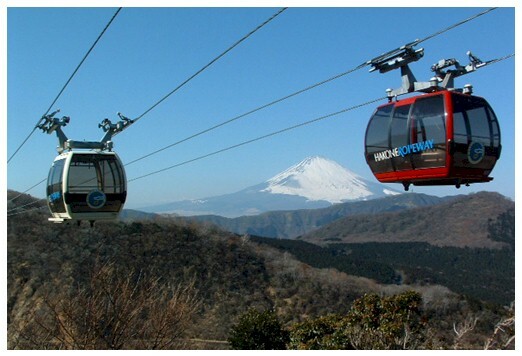 Hakone Ropeway, operates at approximately one-minute intervals, connects Soun-zan station and Togen-dai station at the Lake Ashi-no-ko shore through Owaku-dani Valley in about 30 minutes. Visitors take in such spectacular views as the crystal-clear blue waters of Lake Ashi-no-ko, the rising volcanic fumes of Owaku-dani Valley and the grandeur of Mount Fuji on a fine sunny day. (Note) Resumed the operation from July 26, 2016 after 1 year and 2 months closure due to high density of volcanic gas. Owaku-dani valley was created about 3,000 years ago by the landslide and volcanic activity occurred at the north side of Mt. Kamiyama. Although this was the last volcanic activity in Hakone, still volcanic gases are blowing up at the slope of Owaku-dani valley. 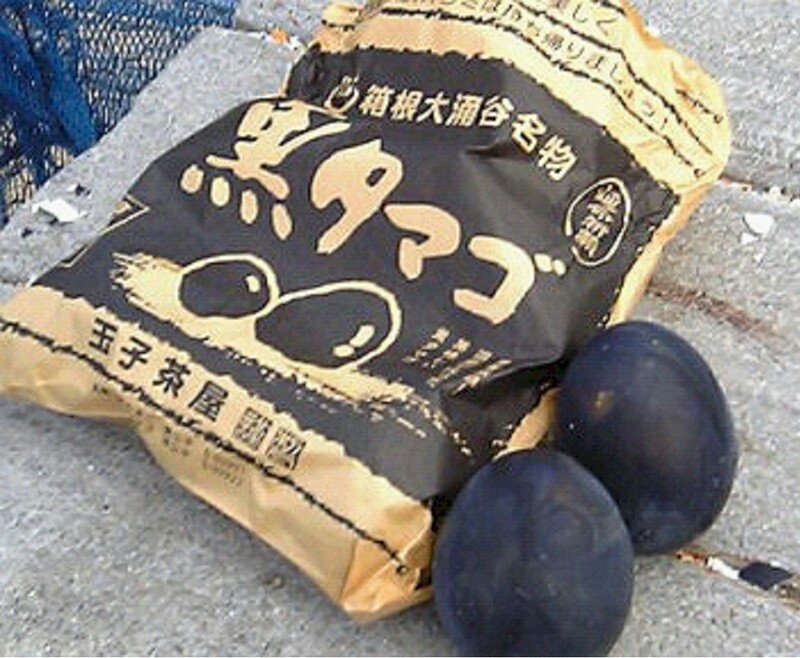 The famous Black Egg is made by boiling normal eggs in the hot-spring water. The hydrogen sulfide and iron, both contained in the hot-spring water, react each other to turn into iron-sulfide (black color) on the eggshell. It is believed that eating one black egg extends your life seven years longer. There is a Jizo Buddha statue at Owaku-dani Valley that is believed for life extension and raising healthy children. Over the time, this life extension belief and a happy number “7” have been combined and turned into “7 years life extension”. After the series of eruptions, Mt. Kamiyama heavily corrupted and blocked several rivers to create Lake Ashi-no-ko 3,000 years ago. Lake Ashi-no-ko is 21.1km in circumference, maximum 43.5m deep and 723m above the sea level. Pirate Ships cross Lake Ashi-no-ko approximately in 30minutes. Three pirate ships, British, French and Swedish, are in operation. There are many historical spots exist in this area. Hakone Sekisyo (Hakone Checkpoint) is the place where Tokugawa government in Edo period (1603~1867) placed an inspection facility for travelers in 1619. Hakone Sekisyo was located on the old Tokaido road, which connects Edo (Tokyo) and Kyoto, and was the most important location to protect the capital city Edo (Tokyo). In 2007, Hakone Sekisyo was restored as it was in Edo period. A part of Old Tokaido road near Hakone Sekisyo is well preserved. Cedar trees planted on both sides during Edo period have been grown up over few hundred years and give you a comfortable shade on a sunny summer day. Onshi-Hakone-Koen Park is located in Togashima, which just into Lake Ashi-no-ko. On this point, the Imperial Household Ministry constructed a summer vacation palace for imperial family members and foreign guests in 1886. After the World War II, the imperial family transferred the land to Kanagawa Prefecture in 1946. In the same year, Kanagawa prefecture opened this land to public as "Onshi-Hakone-Koen Park". 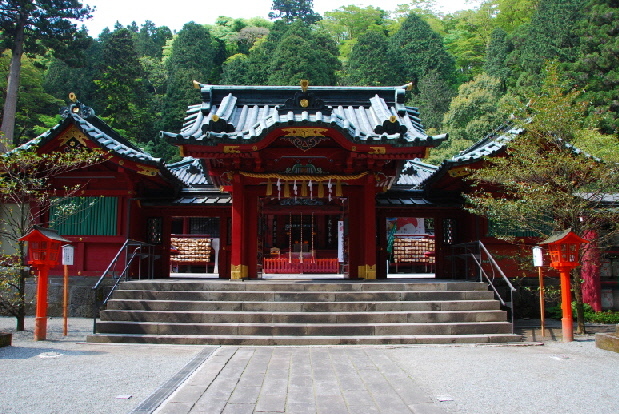 Hakone Shrine, located at Moto-hakone, is one of the major mountain worship places in Kanto area. A priest, Mangan, opened this Shinto-shrine in 757. One of the deities of Hakone Shrine is nine-headed dragon. A red Torii gate of Hakone Shrine stands in Lake Ashi-no-ko facing to the center of the lake where the dragon deity lives. In a legend, Priest Mangan ceased the violence of the nine-headed dragon lived in Lake Ashi-no-ko and turned it to a worshiper. Narukawa Art Museum is located on the slope near Lake Ashi-no-ko. It is one of the leading museums in Japan with a collection of over 4,000 modern Japanese style paintings. From the lounge at the 2nd floor of the museum, you can see the panoramic view of Lake Ashi-no-ko and Mt. Fuji. After strolling around Historical area at the Lake Ashi-no-ko shore, take the express bus to return to Hakone Yumoto station.